Bruise. There is no break in the skin. No risk of infection. Scrape (Abrasion) or Scratch. A wound that doesn't go all the way through the skin. Low chance of infection. Antibiotic drugs are not needed. Cut (Laceration). A wound that goes through the skin to the fat or muscle tissue. Some chance of infection. Most need to be seen. Cleaning the wound can help prevent this. Antibiotic drugs may be needed. Puncture Wound. These wounds break through the skin. Greater risk of infection. Puncture wounds from cat bites are more likely to get infected. Antibiotic drugs may be needed. Wound Infection. This is the main risk of an animal bite. The main finding is redness around the bite and pain. It starts 8 hours to 3 days after the bite. It can often be prevented by early, careful cleaning of the bite. This is why most animal bites need to be seen. Large Wild Animal Bites. Rabies is a disease that can kill people. Bites or scratches from any large wild animal can pass on rabies. Animals at highest risk are bats, skunks, raccoons, foxes, or coyotes. These animals may spread rabies even if they have no symptoms. Small Wild Animal Bites. Small animals such as mice, rats, moles, or gophers do not carry rabies. Chipmunks, prairie dogs, squirrels and rabbits also do not carry rabies. Exception: one of these small animals actually attacks a human (an unprovoked bite). Sometimes, their bites can get infected. Large Pet Animal Bites. Most bites from pets are from dogs or cats. Bites from other pets such as horses can be handled using this guide. Dogs and cats are free of rabies in most U.S. and Canadian cities. Stray animals are always at risk for rabies until proven otherwise. Cats and dogs that always stay indoors should be safe. The main risk in pet bites is wound infection, not rabies. Cat bites become infected more often than dog bites. Cat scratches can get infected just like a bite because cats lick their claws. Small Indoor Pet Animal Bites. Small indoor pets are not at risk for rabies. Examples of these pets are gerbils, hamsters, guinea pigs, or mice. Tiny puncture wounds from these small animals also don't need to be seen. They carry a small risk for wound infections. Human Bites. 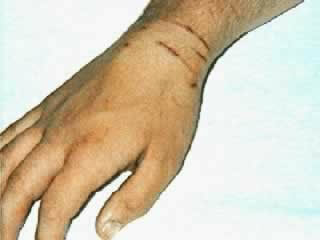 Most human bites occur during fights, especially in teenagers. Sometimes a fist is cut when it strikes a tooth. Human bites are more likely to become infected than animal bites. Bites on the hands are at higher risk. Many toddler bites are safe because they don't break the skin. Bat Bites and Rabies. In the U.S., 90% of cases of rabies in humans are caused by bats. Bats have spread rabies without a visible bite mark. In the U.S., rabies occurs 4 times more in cats than in dogs. In the U.S. and Canada, bites from city dogs and cats are safe. In the U.S., there are 2 - 3 deaths from rabies per year in humans. Pet animal (such as dog or cat) bite that breaks the skin. Exception: minor scratches that don't go through the skin. Tiny puncture wound from small pet, such as a hamster or puppy. Exception: cat puncture wound. Bites that don't break the skin can't become infected. Cuts and punctures always are at risk for infection. Wash all wounds right now with soap and water for 5 minutes. Also, flush well under running water for a few minutes. Reason: Can prevent many wound infections. For any bleeding, put pressure on the wound. Use a gauze pad or clean cloth. Press for 10 minutes or until the bleeding has stopped. For small cuts, use an antibiotic ointment (such as Polysporin). No prescription is needed. Put it on the cut 3 times a day. Do this for 3 days. For pain or bruising, use a cold pack. You can also use ice wrapped in a wet cloth. Apply it to the bruise once for 20 minutes. Reason: Helps with bleeding, pain and swelling. Most scratches, scrapes and other minor bites heal up fine in 5 to 7 days. Watch closely for signs of infection, especially the first 1-3 days.